Very few technologies have had as much long-term relevance in the workplace and classroom as the overhead projector. As workplace and classroom display technology has evolved, bigger and brighter is not only better, but expected, while also needing to be simple to connect to. While the fundamental idea remains the same, we’ve come a long way since the days of transparencies and dry erase markers. Modern projectors allow presenters to project directly from their laptops and mobile devices, and in many cases, audience members can even connect their own devices to take over presentation duties. As a result, projectors now fit more naturally into the presentation workflow, expanding rather than defining the boundaries of what’s possible. It’s with this type of expansion and enablement in mind that Dell is pleased to introduce the Dell Advanced Projector 7760, our first laser (lamp-free) projector. The 7760 stretches the boundaries of where, when and how students or professionals and their colleagues can collaborate, and it’s the latest addition to Dell’s growing Large Displays portfolio, serving conference rooms and classrooms with a strong line-up of projectors and large monitors. Standard projector images can be difficult to see in rooms with windows or bright lights, such as conference rooms and hotel meeting rooms. The Dell Advanced Projector 7760 laser projector provides 5,400 lumens for a bright, large-scale image in a wide range of lighting circumstances. It also makes it easy for anyone to present. With LAN Display, workers can present from any compatible device, including laptops, phones and tablets connected to the network, and can trade presentation duties throughout the course of a meeting. For any devices that aren’t connected by LAN, we’ve made it easy to connect wireless display dongles. And since audio is of key importance in today’s multimedia world, we’ve given the projector two 10W speakers for quality, on-board sound fit for rooms of any size. In addition to the bright image, centralized capabilities and quality sound, the Dell Advanced Projector 7760 laser projector can fill large screen sizes (up 300 inches diagonally), making it a good fit even for halls and auditoriums with 20-plus people. 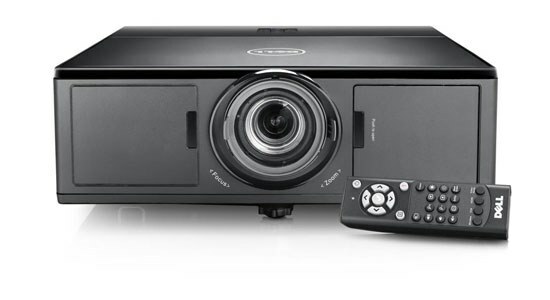 Unlike most projectors, the Dell Advanced Projector 7760 laser projector can be set to operate 24/7 and has 360-degree placement capabilities, so users can mount or place it in any position or angle. These capabilities, combined with the long laser life of 20,000 hours, make this projector ideal for companies that have heavy duty needs. 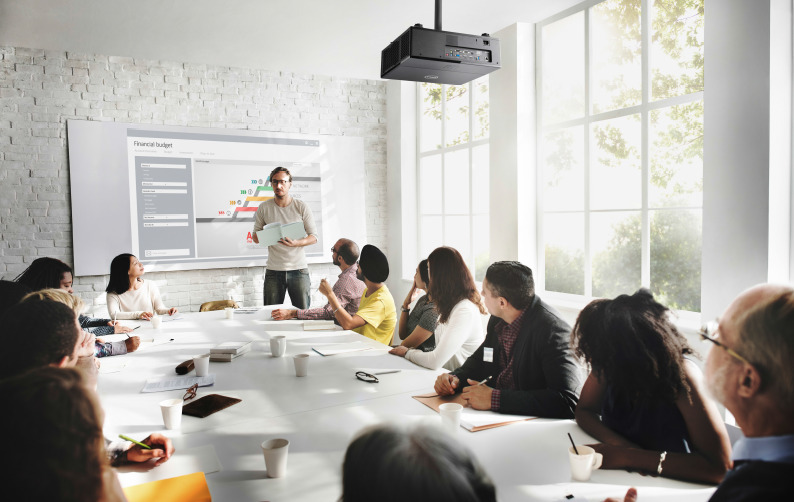 One of the primary benefits of projectors compared with other large-format displays is the cost savings, which can be significant for small businesses and educational institutions with limited budgets. Whereas, in the past, these organizations have required the IT or facilities maintenance resources to replace lamps as they burn out. The laser projector supplants that need by providing 20,000 hours of laser life, up to 10 years for most organizations. It’s low energy consumption, means a lower operating cost as well. All of this is backed by our reliable technology and two-year, extendable Advanced Exchange warranty. The Dell Advanced Projector 7760 laser projector is a shining example of what Dell does best – bring innovative technologies to market that solve real challenges for real users. The Dell Advanced Projector 7760 is a far cry from the projectors of our childhoods, but for good reason – today’s needs are far more complex. And as those needs continue to evolve, our goal is to provide the innovative technology to support customers in working more efficiently and effectively, whether they’re presenting to a conference room of project collaborators, an auditorium of colleagues or a child’s fifth-grade classroom. We’re excited to share this device with customers and look forward to seeing it reach new audiences, while also creating unimagined possibilities for thousands of loyal Dell users.